Fuchs added a comment to D20569: RFC: Use more compact OSD. With the new system shouldn't it be too bad. I can stick the OSD at the position closest to the panel so it never moves as notifications come and go, they would just be positioned above/below the sticky OSD. That's what I'm doing with critical notifications and job progress there and it works well. 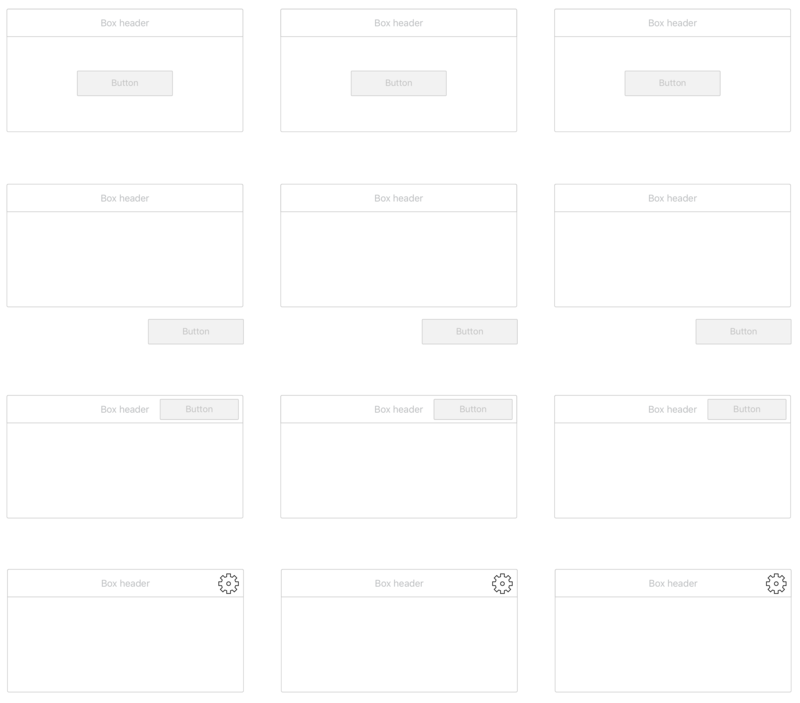 Changing the sort order to prioritize "OSDs" even more than critical notifications is easy. The OSD will not jump, the notifications that are shifted ouf of the way might move, yes, but I don't think that's gonna be too awful. I like the first, small but centered variant. Fuchs added a comment to D19257: [Task Manager] Fix virtual desktops subtext on task tooltip. 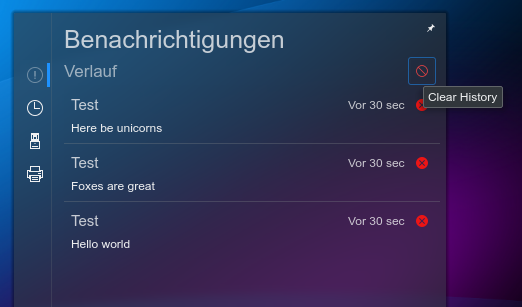 Fuchs added a comment to T10201: Window titlebar colors. I'm in favour of having a different colour for the active window title bar, as this is also what controls like buttons do. Having the same colour for the inactive title as the rest of the window is imho fine. Fuchs accepted D14105: Use a broom-style icon for clearing clipboard and notification history. Fuchs added a comment to D14105: Use a broom-style icon for clearing clipboard and notification history. Fuchs added a comment to T9091: Merge PulseAudio and Phonon KCM. What happens to supported systems that do not have pulse audio? The *BSDs we do support come to mind. Also Linux distributions that do not use PA or offer to not use PA.
Fuchs added a comment to T9113: Decide how to implement pinning (and related) in taskmanager / plasma. Does this have an expected look yet? What would it look like on the desktop? Fuchs created T9113: Decide how to implement pinning (and related) in taskmanager / plasma. Fuchs added a comment to D13582: ScrollBar overlay theme aware..
Fuchs added a comment to T8751: Simplify Panel Resizing and Customization. Fuchs added a comment to D13593: [Fonts KCM] Improve user-friendliness of some anti-aliasing strings. Fuchs added a comment to D13543: Treat scrollbar as overlay. I think it makes it a lot harder to see though, depending on what the background is. Fuchs added a comment to D13534: Change the 'Dismiss all notifications' icon. Fuchs added a comment to T8986: Disable the lighthearted tone in phabricator. Personally I am very much in favour, even to tech-savy people who had to deal with systems like the Atlassian Stack (Jira, BitBucket etc. ), Redmine and GitLab, Phab can sometimes be very confusing and it's not entirely sure if a button will do what you expect it to. I also assume that for people who don't feel terribly comfortable with English yet, it might make it even harder. Fuchs added a comment to T8707: Window borders. In an ideal world I'd agree with you. But if the changes can only be done by few people (or not at all), it would not hurt to safely check beforehand whether a) it is possible b) someone with the needed knowledge and skill is willing to do it, because we can neither force people nor make things happen by magic, so that might safe some time and frustration. Not saying it should be the default for every minor change. Personally I'd be okay with no borders without rounded boarders by default, even though I'd consider it a UX setback to have a less visible resize area just for the sake of a more thin look. To me form follows function. Fuchs added a comment to D12969: [Kicker] Only show "Add to Panel (Widget)" When there's no Task Manager. Maybe we need to discuss things, especially also with https://phabricator.kde.org/D12463 where I have an interest in, on a broader scale. Fuchs added a comment to T7913: Make it really obvious where newly-installed apps can be found. Well, I think I mentioned my arguments about not wanting to override what other applications do by force. Applications where we have no control over what they do and, more important, why they do it. @Fuchs Can you think of any examples where #3 would cause actual regressions, or are the issues only theoretical? Against 3) because the window manager will modify window content which apps are not designed or prepared for. The rest is fine, with my usual "keep in mind that changing a default, in KDE, does override what existing users had and might have liked, please change as few defaults as possible and only where really needed". 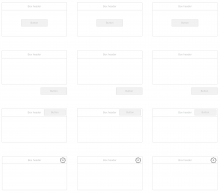 Fuchs added a comment to T8655: Settle on a single style for radio buttons with a title. Personally I prefer the group boxes as they add some vertical separation when multiple radio groups follow. Fuchs added a comment to D12732: Show a warning when running as the root user. Fuchs added a comment to D12462: Add support for icon-only tasks (what browsers call pinned tabs). tough i am not sure i like the implementation: right now is kindof hortogonal to pinned tasks and gets confusing as it has a partial, but not complete overlap. a task still, can be pinned to all activities, so still seems like an useless complication to me. to achieve that, i should do one action, not 2, it looks like bad UI for me otherwise. Fuchs added a dependency for D12463: Add support for icon-only tasks (what browsers call pinned tabs): D12462: Add support for icon-only tasks (what browsers call pinned tabs). Fuchs added a dependent revision for D12462: Add support for icon-only tasks (what browsers call pinned tabs): D12463: Add support for icon-only tasks (what browsers call pinned tabs). Fuchs added a comment to D12463: Add support for icon-only tasks (what browsers call pinned tabs). This is a neat feature, but I worry that it would muddy the difference between the regular task manager and the icons-only task manager. It's not inconceivable that a user wanting to get an IOTM-style panel would resort to using this feature to force every single window to be icon-only. Fuchs updated the summary of D12463: Add support for icon-only tasks (what browsers call pinned tabs). Fuchs updated the summary of D12462: Add support for icon-only tasks (what browsers call pinned tabs). Fuchs requested review of D12463: Add support for icon-only tasks (what browsers call pinned tabs). Fuchs requested review of D12462: Add support for icon-only tasks (what browsers call pinned tabs). Fuchs accepted D12161: [Kickoff] Support non-square icons. Fuchs added a comment to D12161: [Kickoff] Support non-square icons. 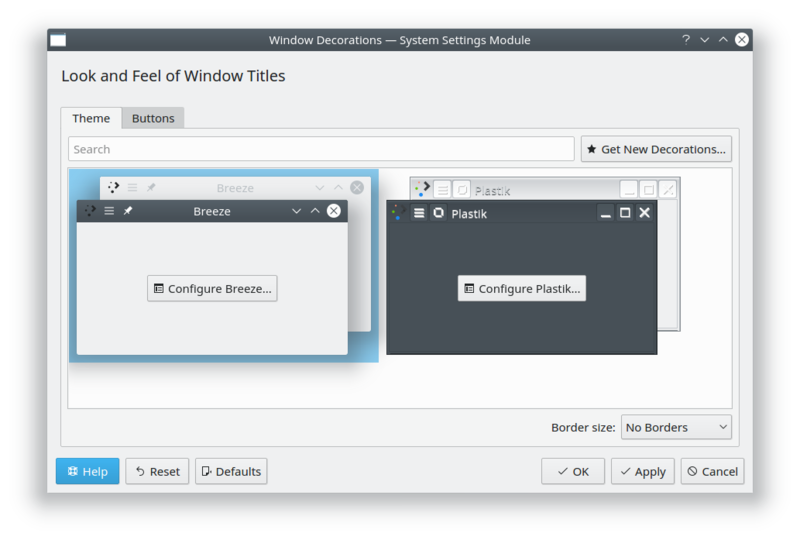 Fuchs added a comment to D11201: Make the Window Decoration themes' Configure buttons more obvious. All right folks, how about this? 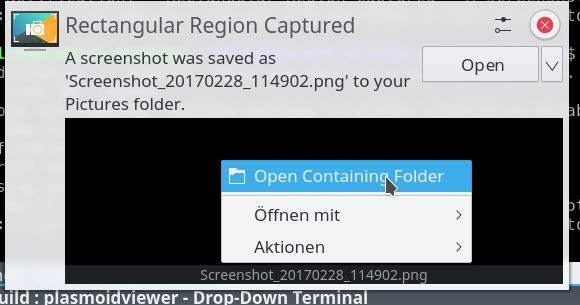 Fuchs added a comment to D11308: Use the default Plasma wallpaper on the lock screen. Fuchs abandoned D11231: Add a page about icon usage, including menu icons. Fuchs added inline comments to D11231: Add a page about icon usage, including menu icons. Fuchs added a comment to D11231: Add a page about icon usage, including menu icons. I don't think screenshots of other (and potentially proprietary) apps should ever be used in our pages. Fuchs accepted D11356: [Media Controller] Show track length if available even if seeking isn't possible. Fuchs added a comment to D11306: Give the "Clear History" button some text. I agree that consistency is important! For that reason, I would propose adding text everywhere. Buttons without text are inherently ambiguous unless their icons are perfect (and even a broom icon doesn't quite get there IMHO, though it's better). I know designers hate excessive text, but users appreciate the clarity and obviousness of buttons with text. How about just "Clear" for the text? That should be short enough even in German, no? The word "history" is pretty redundant anyway. Fuchs updated subscribers of D11306: Give the "Clear History" button some text. Do whatever you want with this button. Either remove the icon or put it on the right, then I wouldn't really mind this change. Fuchs requested changes to D11306: Give the "Clear History" button some text. Sorry, but clear -1 from me for the reasons outlined in the Telegram channel. Please definitely no hover. Whilst I agree that some things get way too tailored for other form factors, this is not one of them. I just very recently discovered that the plasma theme chooser has a preview button that magically appears on hover, so I agree with that being hard to discover and user hostile. Fuchs added a comment to D11137: overflow-menu as view-more-symbolic, and horizontal. Yes, I very much like the overflow and the usage you describe, as per the discussion on Telegram and https://phabricator.kde.org/D11231, I think mixer is however not an example where it should be used, because in the mixer it's not an overflow of functionality, but rather a menu on its own. Fuchs added a comment to D11261: Add a button to clear the notification history. Fuchs committed R120:8c83cc687d4d: Add a button to clear the notification history (authored by Fuchs). Fuchs closed D11261: Add a button to clear the notification history. Fuchs updated the diff for D11261: Add a button to clear the notification history. Fuchs updated the summary of D11261: Add a button to clear the notification history. Fuchs updated the test plan for D11261: Add a button to clear the notification history. Fuchs requested review of D11261: Add a button to clear the notification history. Updated, I didn't see that old community wiki entry, that is of course way better. Linked until it gets ported, which also fixes the second comment as side effect. Fuchs updated the diff for D11231: Add a page about icon usage, including menu icons. Whilst I like the labeled one more than the current one, I can't say I'm a huge fan of either. Fuchs added a project to D11231: Add a page about icon usage, including menu icons: KDE Human Interface Guidelines. Fuchs requested review of D11231: Add a page about icon usage, including menu icons. Fuchs updated the diff for D10901: Add "move to device" functionality to hamburger menu. Fuchs added a comment to D10901: Add "move to device" functionality to hamburger menu. Fuchs updated the summary of D10901: Add "move to device" functionality to hamburger menu. Fuchs requested review of D10901: Add "move to device" functionality to hamburger menu. Fuchs added a comment to T6854: Modernizing Kontact look. Fuchs added a comment to D4838: [Notifications] Add context menu for thumbnail. They are very prone to accidental clicks. If you want to click the (little) arrow but hit the button instead, worst case you get an undoable, destructive action. This gets a lot worse with touch. You should not use a split button with the main button performing a destructive action, of course. Is this in line with the HIG? That's the idea we've discussed above and yes, it is in line with the HIG.